The Woburn is designed with loud in mind and you ll quickly hear by its performance that it holds true to the Marshall name. This loudspeaker hits high trebles cleanly, handles low bass with ease and has a clear, lifelike mid range.The analogue treble, bass and volume knobs give you custom control of your sound. With unique sound design and quality components, it s made to deliver accurate response throughout the frequency range. The Woburn is literally built to thrill. The Woburn is all about modern listening capability. That's why we added the option of connecting digitally via an optical cable. Hook your Woburn up to your TV, Apple TV, Airport express, hard disk player, streaming play and satellite or cable receiver. Optical works with PCM stereo only. 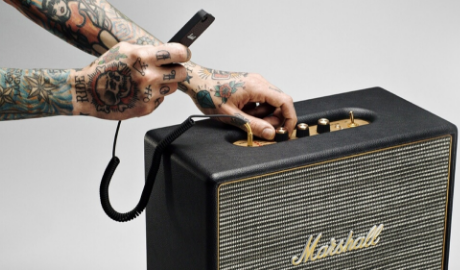 Inspired by the golden days of rock'n'roll, this coiled double-ended stereo cable with two 3.5mm plugs is a modern take on the classic telephone guitar cord cable. Kink-free and extendable, it's your music device's connection to a world of great sound. Some of your music knew a time before Bluetooth. That's why the Woburn enables you to go analogue and connect to those devices that may be collecting dust in your basement. So come on dust off your CD player or turntable (with RIAA) and connect via the RCA input. This input can also be used with your Sonos unit.